My 2006 article, A ‘KISS’ Satellite Station, described how I got on CW through linear transponder satellites such as AO-7 and VO-52 using a simple station built around a 19-inch 2m/70cm mag-mount antenna. In this article, I will describe how to use the same antenna to operate FM through repeater satellites such as AO-27 and AO-51. To be fair, an even more effective way of getting on the FM birds is to use a hand-held dual-band radio (145 MHz up and 435-438 MHz down) and a hand-held beam antenna such as the Arrow (www.arrowantennas.com) or the Elk (www.elkantennas.com). You may even have seen me doing this on Field Day in years past. However, walking around with a hand-held beam may not always be your idea of fun, especially at night or in bad or hot weather. Don’t despair; the 19-inch KISS antenna on your roof or car can be made to work just fine. AO-27 and AO-51 are cross-band repeaters, with uplinks in the 2-meter band and downlinks in the 70-centimeter satellite sub-band (435-438 MHz). To operate through them, you will obviously need a radio capable of transmitting on one band and receiving on the other. To do it with a KISS antenna rather than a beam, you will also want power output of at least 20 watts and preferably something in the 50-watt range. Fortunately, most currently available mobile-type dual-band FM radios will meet these requirements easily. However, as I discussed in the earlier article, satellite downlink signals are quite weak, especially at 435-438 MHz. Most FM radios are designed for use with strong local repeaters, not weak satellites hundreds of miles in space, so you’ll probably want a low-noise, RF-switched preamplifier for the 70 cm band. Suitable units are available from several sources, including (in roughly ascending order of price and performance) Mirage, Icom, Advanced Receiver Research (ARR) and SSB Electronic, among others. Some of these (the more expensive ones) are designed to be mounted at the antenna, for even better performance. However, unless you have a long feedline, you will probably find that keeping the preamp in the shack will be good enough. I was fortunate to live in suburban New York City during the period right after the war when military surplus flooded the market. Suddenly piles of expensive receivers and transmitters became available for a teenagers with a limited budget. In a short period of time I was able to purchase equipment that was usable on the amateur radio bands and the prospect of becoming a radio amateur became feasible. At the same time the government passed laws which made becoming a ham much easier. The reduction of the code requirement to 5 words per minutes and a simplified written examination was a great boon to high school students like me. So just as soon as I could get my code speed up to 5 words per minute I took the exam and passed it. Looking back almost seventy years I wonder at the sheer amount of misinformation I had at the time. The first problem was that I had no idea of how to connect a transmitter to an antenna. I thought that if I could hear a station I could talk to that station. Amateur radio operation in the 1950 s was primarily on low frequency bands. Novices were licensed to operate low power CW transmitters in the 80 meter band using Chrystal control. Most cheap surplus transmitters which we had obtained were variable frequency controlled and designed to work into short military antennas. In contrast today’s new hams can buy cheap handy talkies that connect to local repeaters so they can communicate immediately. In contrast I was faced with a steep learning curve before I made my first complete contact. My first problem was space. Antennas available for the frequencies for which I was licensed were at least 135 feet in length. I did not have anything like that available from my bedroom window. Somehow I found the room by stringing a wire just below the power lines to tree on a neighbor’s property. I learned a lot about stealth wires in the process. Antennas of that type were end fed and required a tuner. The tuner had to be coupled to the equipment I owned by a matching network. All of these devices required adjustment before a contact could made. Antenna Restrictions? Lose the Mic! As we know, far too many hams are affected by antenna restrictions: CC&Rs, zoning problems, rental properties, etc. Possible solutions vary with the specifics of the situation, some being more "solvable" than others. What about hams who find themselves in the "less solvable" category but still want to operate HF? Unfortunately, there's a pattern that I've seen repeated all too frequently. The ham (we'll call him Sam) puts up a "stealth" antenna of some sort, buys a transceiver, and goes on SSB because it's the only mode he feels comfortable with. Besides, his buddy Fred, you know, the one who lives on a farm with a 100-foot tower, has so much fun yakking with his friends all over the world on 20 meters. When conditions are right, Sam has a blast. Unfortunately, however, that doesn't occur very often, especially with sunspots being as rare as they are. In fact, Sam is getting increasingly frustrated. Why can't anybody hear him? When he does work someone, he has trouble getting his name and call across with a 3x3 report, let alone carry on a conversation. Sam now finds himself going on the air less and less. Before long, he'll probably sell the radio and go back on 2-meter FM, or even give up hamming entirely. I've seen it happen many, many times. Does Sam's predicament sound like yours? There may be things you can do about it, even if you cannot improve your antenna situation. Here's one of the simplest: lose the mic, or put it away for use only on the local net. Switch to CW, or if that's not your thing, learn to use PSK or RTTY. Don't get me wrong. I'm not anti-SSB. I've been on it since 1958, when I built a Central Electronics 20A phasing exciter. It's just that the laws of physics are what they are, and SSB is so inefficient compared with CW and digital modes that for those unable to have a good antenna, the latter will be far more effective. 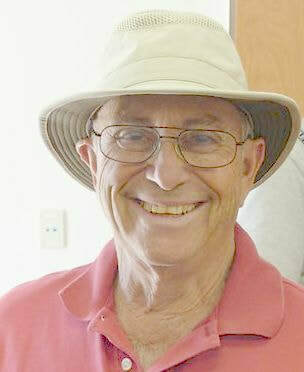 Michael Tannenbaum, K2BN Living in Green Valley with its antenna restricted has brought back many ham radio memories. I have been licensed a long time. My original license was granted in 1952 and my lack of experience became obvious the first time I keyed a transmitter. I expected that the whole amateur fraternity would immediately recognize me the second I keyed a transmitter. Alas even my neighbor ham 1 mile away was unable to hear me. Somehow I neglected to read the chapter on antenna tuners and I expected that if I could hear them they could hear me. I quickly learned that one needed a "resonant" antenna of some type and/or some kind of "matching" device called an antenna tuner. Unfortunately the 80 meter band (which was the only band my NC 125 heard and the only one which I had crystals for) required an antenna which was at least 135 feet long. Unfortunately for me I lived in suburban Long Island in a house on a 100 foot by 100 foot square plot. Not enough room for an antenna. Looking at the problem from the vantage of a 17 year old, the solution was simple. Attach one side of the antenna to the side of the house and find a tree or phone pole 135 feet away, regardless if the antenna ran over the property of a neighbor. Reading the ARRL guide, I found that I could connect the antenna to my transmitter with 300 ohm TV line. Of course the little matter of unbalanced output on my transmitter (there was a coax connector) and the balanced twin lead did raise some concern, however I simply ignored the problem. After all I now had a resonant antenna. Unfortunately it did not work any better than my previous solution….a random wire. Going back to the book, I found that I should have continued to read the section on connecting the transmitter to the antenna. I need a coupler which required components that I did not have. Lucky for me, I lived only 20 miles from New York City and the Cortland Street radio surplus market was in full swing. In 1952 even 7 years after the end of the war, one could find almost anything electronic at bargain prices if one knew what to look for. Everything was in black dusty boxes and was quite heavy. Also anything that could be remotely related to ham radio had become (from my point of view at 17) quite costly. After paying the train and subway fare I had only $5.00 to spend. As I remember, the only practical solution was a BC 375 tuning unit. For those who may not know, the BC 375 and the related BC 191 were aircraft and mobile transmitters designed in the 1930s that were made in enormous quantities for use in the B 17 Flying Fortresses and army mobile ground stations. They used enormous transmitting tubes (VT-4s or 211s) and were physically quite heavy. Needless to say they were also lousy transmitters being both unstable and highly inefficient. Have you ever wanted to talk with your ham radio friends back in your old home town? Sounds easy enough to do, all you need is an HF radio and an antenna. Oops, I forgot about those pesky CC&Rs that prohibit antennas on your house or property. You had better run out to the car and use the mobile rig. Darn, the bands aren’t open today; you’ll have to try again another day. There’s a reliable alternative to HF. Using Voice over Internet Protocol, (VoIP) as incorporated in EchoLink and IRLP, (Internet Radio Linking Project) you can call other hams all over the world. How would you do this? The club intends to install an EchoIRLP node on one of the club repeater. You will then be able to call any individual or repeater that has either EchoLink or IRLP capability. An EchoIRLP node is a hybrid that incorporates both VoIP systems in one computer. Only one system at a time may be accessed with no capability of interconnection between the two. The computer uses Linux as an Operating System and subsequently is extremely reliable, running for long periods of time with no administration required. The OSCAR station described here is about as far from state-of-the-art as it is possible to get, and still have it work. Virtually everything about it can be improved upon, with better antennas, lower noise figures, etc., etc. I even wrote many of those station-improvement articles myself. So why did I write this one? I keep hearing so often, from so many people, how complicated and difficult it is to get on the linear-transponder satellites – currently AMSAT-OSCAR 7, Fuji-OSCAR 29, and VUSat-OSCAR 52 – so I want to show how easy and inexpensive it can be. The following is a true story. During 2005 I sold my house in New Jersey and began moving W2RS into the house in Green Valley, Arizona, that I had purchased the previous year. I expect the process to go on for a long time: what ham station is ever really finished? Be that as it may, December found me with Straight Key Night on OSCAR coming up and no satellite antennas other than the Arrow hand-held beam and MFJ-1717 whip that I’ve been using with hand-helds on the FM birds. Not an acceptable situation, by any means! How to get a home-based CW station onto the linear-transponder satellites quickly and easily became the order of the day. From the New Jersey QTH I had brought most of the station equipment I would need, all of it relatively ancient but still working: Icom IC-290A and IC-490A multi-mode transceivers for 145 and 435 MHz, respectively, as well as a Mirage B1016 2m amp and a Tokyo Hy-Power HL-90U amp for 70cm. As driven by their respective transceivers, the two amps measured 150 and 70 watts output, respectively. There’s nothing magic about any of this equipment except that I happened to have it already. Whatever you have or can beg or borrow will probably work too, if it’s even roughly comparable. One caution concerning equipment, however: if you plan on using a single transceiver to cover both the 145 and 435 MHz bands, be sure it is capable of listening on one band while transmitting on the other. Being able to hear your own downlink is highly desirable, but not absolutely essential, on the FM satellites. It’s critical, however, to have this capability when operating CW or SSB through a linear transponder. Now for the KISS part: the antenna. What could be simpler than a 19-inch 2m/70cm mag-mount whip? At a hamfest, I picked up a new one. It happened to be a Pro-Am MO144-440 with a matching mount. In the catalogs, the combo is listed at $47, but the hamfest was ending soon and the dealer was happy to part with it for $30. A friend# with an extension ladder (I don’t climb anything higher than two feet) put it on the roof for me – actually, he plopped it on top of my house’s rooftop heating/AC unit, which is about four feet square and provides a good ground plane. Also, my heating/AC unit is not far from the shack, so a long run of coax isn’t required. The longer the coax, the more loss. There’s nothing magic about that particular model either. Just be sure that the one you use will handle the power you want to run. You can find lots of longer antennas, with more gain, but for reasons we will discuss shortly, I do not recommend them for this purpose. A 19-inch dual-band whip, or thereabouts, is just about right for a KISS satellite station.